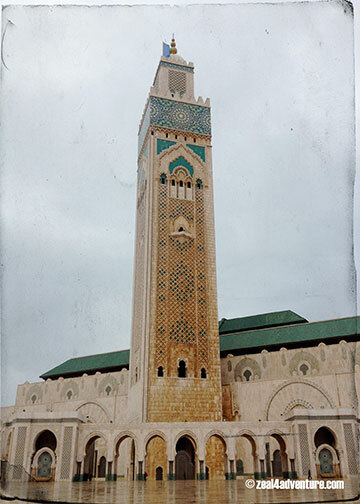 Towering over me, I felt very small, its minaret standing 210 meters (700 ft) tall, the tallest in the world, in fact. Half of its enormous structure sits on land, and the other over the sea on reclaimed land. I walked barefoot inside, awed by its intricate beauty and incredible size. “I can show you around town tomorrow”, our reliable grand taxi driver offered before he dropped us at the hotel the night before. 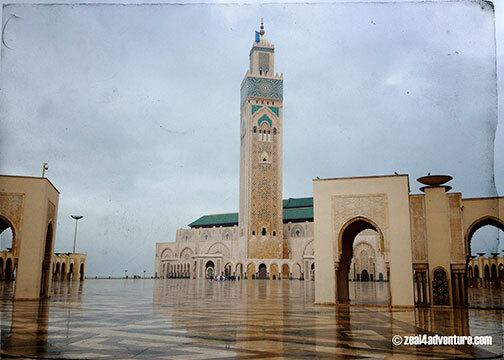 For 550 Dirham, Aziz endeavored to introduce us to his Casablanca in 4 hours. First off the agenda was his and the rest of Casa’s pride. 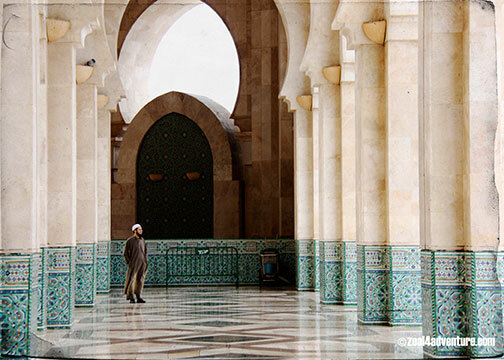 The Grand Hassan II Mosque. 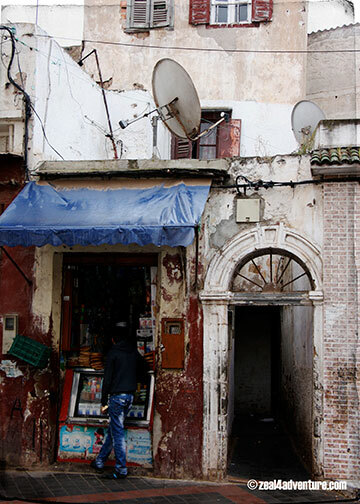 It is the largest in Morocco and the second largest in the world, the brainchild of the late King Hassan II when he felt that Casablanca was somewhat lacking in traditional sight. 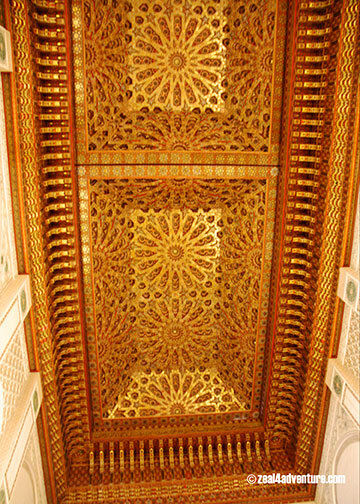 It was not only built to withstand earthquake, but the grand mosque also comes with a sliding roof and a heated floor – a beautiful blend of traditional Moorish Architecture and modern innovation. 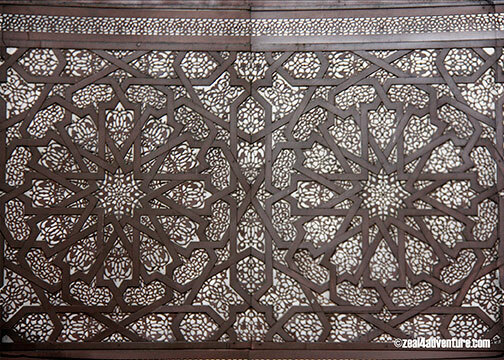 hemmed in beautiful wood carvings, stucco works and ornate traditional Moroccan tile work called zellij. 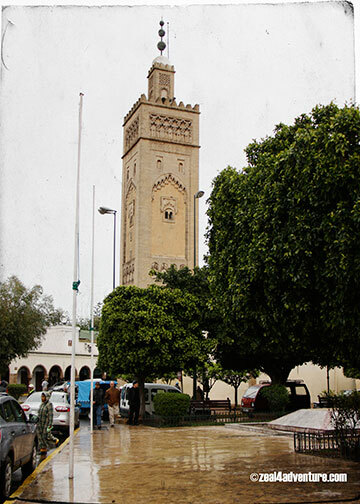 Aziz wanted to show an old part of Casablanca; he dropped us off at the Marrakech gate of the Old Medina with its imposing clock tower. We wandered through the labyrinth of narrow streets of the walled city, which includes an 18th century fortress, a jewelry market and a kaleidoscope of other stores – souvenirs, handicrafts, leather goods – all requiring more than a little skill in bargaining. 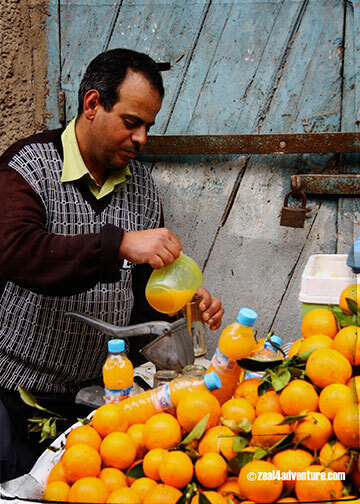 Carts laden with oranges peppered the streets, and a medley of Moorish and Portuguese architectures reflecting its own personality and charm. There were children playing and old women filling up at the water station or just sitting at the doorway. 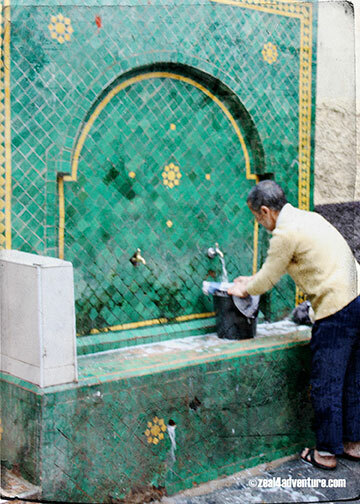 Not as bustling and quite run down compared to the glories of Fes and Marrakech, the “Ancienne Medina” is a place Moroccans venture to only if there is a need to do so. It is a part of Casa that predates the French Protectorate, and in many ways, a closed quarter where bikes and cars are restricted. 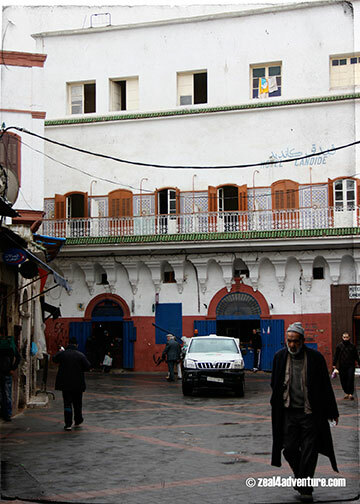 In the 1930s, the French created the Habous neighborhood just a short ride away from the old walled city, wanting to build a nicer, cleaner medina. 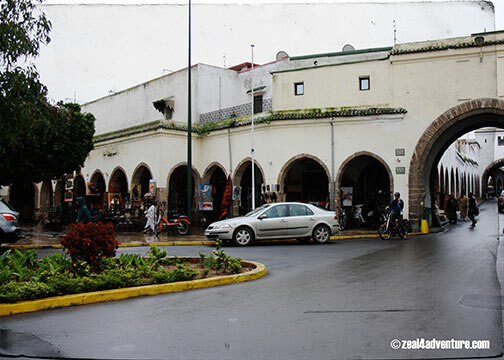 Also known as the Quartier Habous, the New Medina is home to some excellent shopping opportunities at the Joutiya market, a handicraft market selling top artisan product. 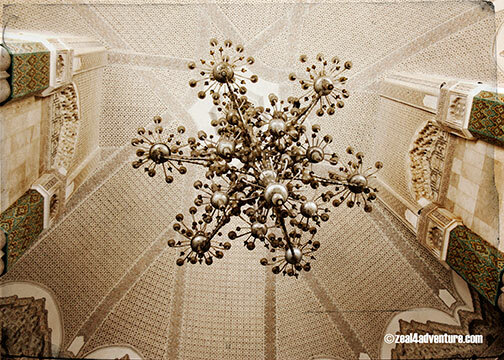 and the Moulay Youssef Mosque. A pleasant place to while away time. We weaved through the neighborhood until it was time to be reunited with our luggage and say goodbye to Casa. A setback that ended in a good way, at the very least it was a delightful introduction to Morocco, a country that can be overwhelming at first. 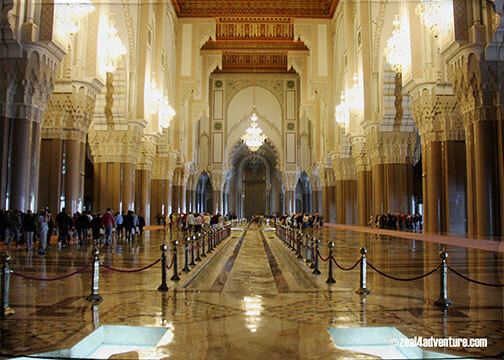 Tours: Guided tours are offered throughout the day to non-muslim visitors. Be sure to dress modestly and remove your shoes before entering. oh this is delightful. 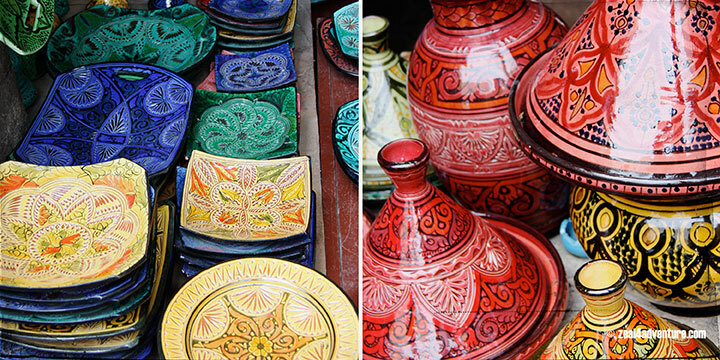 the sights, the patterns, the intricate designs of both architecture and pottery. 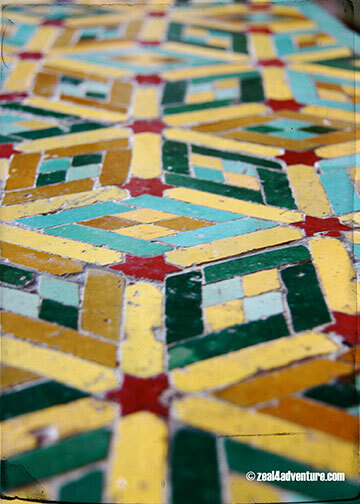 the tiled walls, the exotic smells. it all must have been one experience never to be forgotten. lucky you.